...are close to Disney World, Orlando - the ultimate family vacation destination. Solterra Resort is located in an area with easy access to theme parks, dining, and shopping. The resort is designed with tranquility & relaxation in mind and you can enjoy many recreational activities right at the resort. Soak up the sun by the pool knowing that all you need to complete your vacation is only minutes away. The interiors of these Solterra Resort rentals showcase spacious floor plans that take full advantage of the open layout by punctuating them with sleek contemporary elements and sophisticated décor. 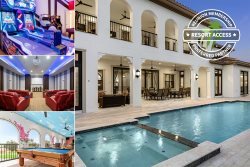 Solterra Resort is a new vacation home community located in the Kissimmee area with easy access to Orlando’s theme parks, dining, and shopping. Designed with tranquility and relaxation in mind, you can enjoy your recreational activities right at the resort. Soak up the sun at the pool by the luxury clubhouse and cabanas while shops, restaurants, golf courses and world-famous attractions are only minutes away. Grab a bite or refresh with a cold drink in the recently inaugurated Cafe de Sol Bar & Grill. Are you a Vacation Home Owner in Solterra Resort? If you're interested in our comprehensive property management and marketing services please get in touch. We're actively taking on Solterra Vacation Rental Homes.